FAQ: What are good sources of less common agile test ideas? In this installment of FAQ, SQE Trainer Rob Sabourin answers one of the questions students ask him most often. Having trouble starting projects, understanding scope and business processes, or with estimation? Mark shares some tips and techniques to avoid common business analysis pain points at the early part of a new project assignment. What makes testers successful on agile teams? What skills do agile testers need to enjoy an exciting career and how can they learn those skills? In part one of our "Learning for Agile Testers" series, we explain what a well-rounded agile tester ought to know–and it goes way beyond technical skills! For many organizations, automation is a burden--even with good tools. Keywords are popular but don't suffice on their own. 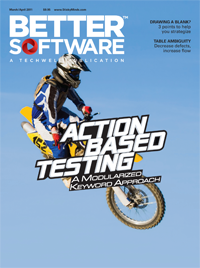 Action based testing places a high emphasis on modularized test design, not only making tests lean and mean but also allowing for very stable and maintainable automation.